Gov. Jerry Brown said the state Legislature should “man up” in making budget cuts to end a budget deficit he now pegs at $9 billion. It was an echo of Gov. Arnold Schwarzenegger attacking legislators as “girly men” for not passing his budget. Say, isn’t that politically incorrect, sexist language? Shouldn’t the P.C. Legislature censure Brown and Arnold? Shouldn’t the National Organization of Women begin a recall of Jerry? “there seems to be something inappropriate about proclaiming that it’s manly to cut services for the politically weak: poor welfare moms striving to become self-sufficient and old disabled people who need help at home so they can avoid costly nursing homes. But why doesn’t Skelton himself “man up” and call for ending the collective bargaining of the state’s ultra-powerful government-worker unions? That power was given them by the infamous Dills Act, which Brown signed into law in 1977 during his first gubernatorial stint. It effectively allowed the unions to “elect their own bosses,” as one union leader put it. Or how “manning up” to call for ending the massive pensions that go to retired workers? Begin with the 9,111 members of the $100k Pension Club. The top one is Bruce Malkenhorst, grabbing $509,664.60 a year. Cut that and the others back to $99,000 a year, still plenty to live on. That way, the pension payments taken from the geneeral fund — about $3 billion a year — could be reduced. And the saved money could save programs for the poor. The same thing with the administrative bloat in the Cal State system, where there are more administrators than professors. Why not cut that bloat and give the money to the poor? When these things happen, why does Skelton always take a bead on the taxpayers? Then there’s Brown supposedly needing to “man up” and push a tax increase through the Legislature. As Skelton pionts out, in his 2010 election campaign, Brown pledged that he would increase taxes only after a vote of the people. If he hadn’t done that, Meg Whitman might have beaten him. So what’s wrong with carrying out the will of the voters? Shouldn’t we commend politicians on the rare occasions they meet their promises? And Brown also remembers how his former chief-of-staff, Gray Davis, was recalled as governor in 2003 to a great extent because Davis increased the car tax. Brown knows that, even if he somehow cajoled enough Republicans into joining a two-thirds supermajority in the Legislature to pass a tax increase, he would generate rage among the masses, maybe even a recall drive. Moroever, at this late date, a tax increase would hammer the state economy, putting more Californians out of work. Then hundreds of thousands more people would use the welfare services whose cuts Skelton is decrying, making welfare department budgets even worse. Thanks in part to 50 years of cheerleading by Skelton, California’s government system is top heavy with high taxes, preposterous bureaucracy and mammoth waste. The government-worker unions need to be tamed so that the people, not the unions, again run the state. But Skelton won’t “man up” and back such reforms. Instead, he takes the easy route of going after the taxpayers that already haven’t gotten out of Dodge, Calif. There are few real men left in America. The feminization of America started in the 70’s and never looked back. Around the world they call us ‘sissies’ in their respective language. By and large, they are correct too. We have been indocrinated. Look at your average TV commercial and at how men are ridiculed, degraded and made to look like village idiots. I am not complaining either. I am simply telling you what IS. If you understand the purpose behind it all it’s comical. Anyway, that’s your country. Love it or leave it. Why is what Skelton says so important? He’s just another bought-off American journalist. Ignore him. Brown is not a stupid politician – but he is a deceitful one – as are 99% of the others. So far he has played it smart by turning to tax decision over to the people. If it passes we only have ourselves to blame. If it fails – Brown will be forced to move onto Step 2: Pushing for a 2/3rd majority in the Ca senate and assembly. That is much more risky. The people would revolt after voting down the tax measures. November will be a very important month for Ca and for the nation. Skelton is just a cadaverous leftist propagandist who nobody reads or cares about. Deeper question: How is it that the California stereotype of “fruits and nuts” (carefree, let it all hangout, anti-establishment liberals) has transmogrified into its pollar opposite (a tyrannical authoritarian establishment)? My dad must be doing sommersaults in his grave. He had a hard time adjusting to the microwave. What we are witnessing today is just short of a total reset. I’m pretty adaptable and it’s really starting to screw with my mind. Oh well. Roll with the punches. Life goes on! Isn’t it ironic that leftists have embraced a total government takeover? But, this was done only when it benefitted them financially. The same people in the 1960’s and 1970’s were screaming and protesting the government involvement in anything. The prostitutes are not just the “capitalist pigs,” but the leftists who got a taste of the riches at the public trough, and sold out completely. Unions will eat their own….senority and tenure…the battle for budget dollars…fill in the blanks….the end is near!!!! 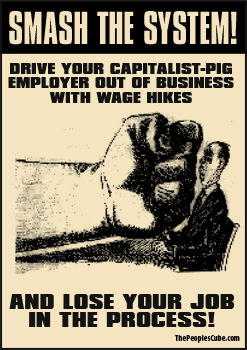 Well, at least you acknowledge that the ‘capitalist pigs’ are prostitutes too. And that’s a good start. I like objectivity. Taxpayers MUST find a way to refuse any further funding of pensions greater (as a % of pay) than what THEY get. Currently, the Taxpayer paid-for share of Public Sector Plans, when taking into account the COLAs and the very early FULL (unreduced) retirement ages, as well as the VERY rich formulas, are ROUTINELY 2,4, even 6 times (for Safety workers) greater in value in retirement than those of comparable Private Sector workers. With cash pay no less in the Public Sector, ANY greater pensions are unjustifiable, let alone multiples greater. ZERO further funding. Let Plan assets buy whatever share of promised pensions possible …. and no more. Taxpayers have been financially raped by the Public Sector Unions (and members) and cooperating politicians LONG ENOUGH ! It’s about time for you to “man-up” John, and report accurately on the history of public employee labor rights in California. Ronald Reagan, that paragon of conservative virtue, signed the Meyers-Milius-Brown Act into California law in 1968. That’s the legislation that gave California’s local public employees the right to collectively bargain for wages, hours, working conditions and benefits. Since Reagan was a big chip off the old Barry Goldwater block, it certainly appears that collective bargaining for public employees was implemented by the same libertarian leaning, right-wing Republicans who have run Orange County and the conservative cow counties in our state for the last century. You might at least attempt an honest assessment. Reagan increased taxes $1 billion, about $20 billion in today’s money, which is more than Schwarzenegger’s $13 billion tax hike of 2009. And in eight years in office, Reagan more than doubled spending. Reagan also signed into law the first withholding of income taxes, breaking a campaign promise. And he signed a law liberalizing abortion, which he later regretted (but then as president put two pro-aborts on the U.S. Supreme Court, O’Connnor and Kennedy). I’ve long since lost any illusions I had about Reagan; or even Goldwater, who wimped out and became a liberal on many issues after he lost in ’64. Skipping Dog, All your comments quote laws and history summarizing the Legal “protections” afforded Public Sector workers. While arguably many of those protections exist, most were approved ONLY because of the cozy (Campaign contributions for favorable votes) relationship with lawmakers. None of these “protections” are afforded Private Sector workers whose contributions and the investment earnings thereto paid for 90+% of YOUR pension (given the retroactive increase you received via SB400). Taxpayers are beyond fed-up with overcompensating Public Sector workers, primarily via extraordinarily generous pensions and heavily subsidized retiree healthcare often starting well before Medicare age …. and we are determined to change it (and NOT just for new workers). As a retiree, you are likely lower down the list to whom we will be looking for givebacks, but don’t get too comfortable (or arrogant or pompous) because when the “actives” start getting hit hard, THEY will be mumbling … why aren’t the retired sharing in these givebacks to lessen our burden. If government employees pay half the cost of their retirement benefits, local governments will save at least $2 billion annually. Savings begin with the next pay period and continue into the foreseeable future. Teachers and state employees already pay half or close to it, but many thousands of city and county employees pay little or nothing for retirement benefits that are extraordinarily generous. The courts protect those benefits, but employees should split the cost with taxpayers,just as employees split the cost of their 401(k) if their employers match. 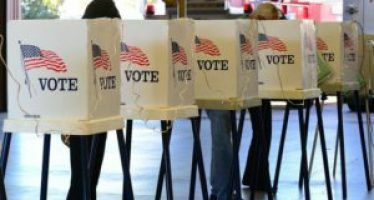 The Legislature has two months to put a constitutional amendment on the November ballot. John – good article, and I agree that a simple pension cap is the best way to handle the financial challenges facing pensions. But why $99K as the cap? Social Security places a cap on benefits of $32K. Why not cap pensions at twice that; at $64K? Or why not cap pensions at $50K per year? This is still enough to live on if you’ve paid off your mortgage and eliminated your debts, as people ought to do when preparing for retirement. And it would SOLVE the problem overnight. Responding to FixPensionsFirst…. What would YOU rather have someone ELSE pay for towards your pension, (a) HALF of a pension equal to 75% of your pay, or (b) HALF of a pension equal to 30% of your pay ? Well, full career Public sector workers get the 75% pensions and Private sector workers get the 30%. So I ask you ….. with “cash pay” at least as high in the Public Sector (vs the Private Sector), WHY should the taxpayer subsidy towards Public sector pensions be greater than the subsidy afforded Private sector workers from their employers. If the Private sector worker gets a subsidy sufficient to provide HALF of a 30%-of-pay pensions, then that’s what Taxpayers should contribute towards Public Sector pensions. If they want bigger pensions, they should pay for the balance themselves. We are a nation of law, Tough Love, so my reliance on the law is perfectly appropriate. Would you prefer it were otherwise? Skippy, I would GREATLY prefer that our elected representative honored their obligations (to Taxpayers, 85% of whom are NOT Civil Servants) and didn’t pass laws and “protections” ONLY afforded Public Sector workers …. knowing that Union campaign contributions had a lot to do with the introduction and passage of such laws.